Update: Darn it. I read the date wrong so this whole post doesn't make any sense. The incident occurred on Friday night; we were there on Saturday night. You can just ignore this post. 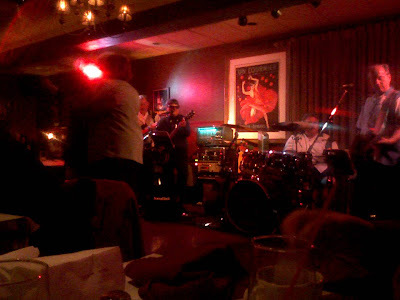 The band on Friday night was The Tony Smith Show and not Roy and the Orbitz. Mom, my little sister and I left the Chambers lounge on Saturday before the fight broke out. 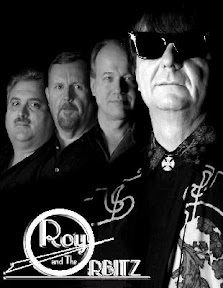 We'd finished our meal and caught just the first few songs by the Roy Orbison tribute band Roy and the Orbitz. The first I'd heard of the fight was when my sister sent me a link to two Chicago Tribune videos: "Officer accused of beating 2 people in a bar" and "Cop charged in bar attack tells a different story". The cop, who had some vaguely-described prior run-in with the police in 2006, has been relieved of his duties. He was arrested by the Niles police, was released on bond and is to appear in court in June on charges of battery. So the question is: If Roy and the Orbitz are called to testify, and are asked to do so in song, what Roy Orbison song do you think they'd sing? Update: A cell phone picture I took that night. As much as the lead singer looks like Roy Orbison, the bass player looks like Colin Mochrie. Perhaps they should add Hyakugojyuuichi!!! to their repertoire.